Sure, the best place to cool down in Phuket is in the Andaman Sea surrounding the island, but those looking to take a dip in a swimming pool have plenty of options, too. Many resorts around Phuket will let outside guests use their pool for a fee, or even for free if they dine there, and Phuket’s public pools offer a cheap retreat from the heat. Here’s just a sampling of what’s on offer. Space to float. Angsana Laguna’s pool is one of the biggest we’ve seen. Just down the road from Wat Chalong is the Phuket Country Home housing estate with a basic but clean concrete pool lined with a few sun beds to relax on. A small kiddie pool is set at the end of the pool under roof cover, and at the opposite end is a simple Thai restaurant and reception area with tables overlooking the pool. Entry is 70 baht for adults and 50 baht for kids. During the week most of the pool is sectioned off for children’s swimming classes from 17:00 onwards so it’s best to come earlier. Cheap, cheerful and clean. The pool at Phuket Country Home. Two other choices for budget-minded swimmers are the public pool at Saphan Hin park in Phuket Town and the swimming pool at Cherng Talay Fitness Centre, found just outside the entrance to Laguna Phuket resort near Bang Tao beach. With two waterslides and a small play park outside, the Cherng Talay pool is a good option for families with kids. Serenity’s one of our favourites. Easy to see why. Serenity Resort in Rawai beach is a top spot for swimming. First, the pool itself is a gorgeous deep-blue tile expanse with a shallow kids’ section, jacuzzi jets and sea views. Second, it has a good poolside restaurant with cosy lounge seating and a big menu that, while not cheap, is reasonably priced for a luxury resort. Third, Serenity has daily happy hour prices from 17:00 till 19:00 and puts on a number of themed dining and drinking events if you’re looking to extend your swim session into something more festive. Best of all is Serenity’s open policy: even if you’re not staying here, you’re given free access to the pool, with the unspoken expectation that you’ll spend your money on food and drink. Just down the road is Friendship Beach Resort, which has the same open policy with no charge for using its swimming pool. Like Serenity, the pool is at a beachfront location for enjoying the sea breezes, with a shallow section for kids and whirlpool jets. Friendship’s thatch-roof sala setting is more low-key than Serenity but the food prices are about the same. 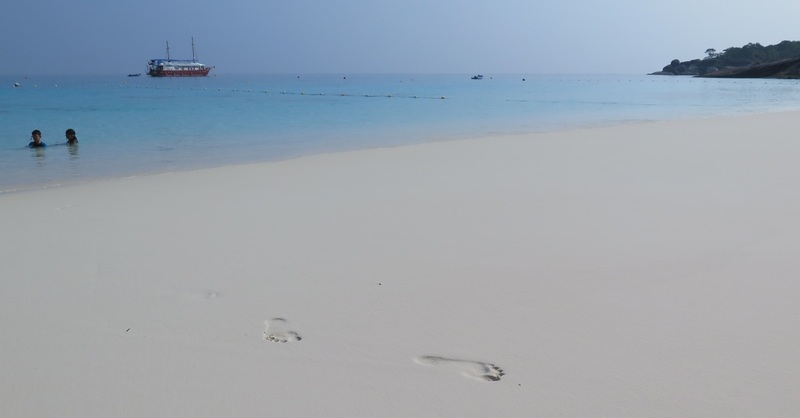 Take a luxurious dip at The Village Coconut Island. Another resort that, so far, allows free pool access also offers a small adventure to reach it. The Village Coconut Island resort is found on Ko Maprao, Coconut Island, about five minutes by boat off Phuket’s east coast. We’ve been a few times and found it to be extraordinarily welcoming to non-guests – we arrived with kids and towels in tow and no one batted an eye when we waltzed in and jumped into the pool. 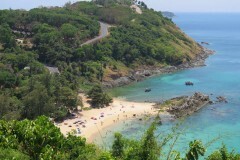 To get there, you first have to go to Laem Hin pier just north of Phuket Town down a well-signed road off Thepkrassatri Road (the airport road). At the pier you’ll see the sign indicating where The Village boats depart from, which they do every half-hour. Hop on the boat and enjoy a free ride to the resort. Once there, make your choice of swimming in the large beachfront pool, or wander just up the hill for the pool with two waterslides. Next to the pools are a small convenience store and an open-air restaurant. Kids love the slides at the DoubleTree Hilton resort. Back on Phuket, the Laguna resort complex along Bangtao beach allows access to some of its resorts’ pools, kids’ clubs and fitness facilities for a fee. The fees vary depending on the resort, ranging from a 900-baht adult day pass for Dusit Thani Laguna Resort to 1,600 baht a day for Angsana Laguna resort with discounted rates for children. Those looking to make a splash at Surin beach could visit DoubleTree Resort by Hilton, which offers a day pass for its swimming pools and fitness room for 500 baht. A kid-friendly resort, the pool is huge and has a sizeable waterslide.